Apple's macOS (known as OS X before 2016) is a multi-user operating system with unique home folders for each user; each home folder contains data specific to the user. Your home folder is the repository for your music, movies, documents, pictures, and other files. It also houses your personal Library folder, where your Mac stores system and application data related to your account. By default, your home folder resides on the startup drive — the same one that houses OS X or macOS (depending on the version). This might not be ideal, however. Storing the home folder on another drive might be a much better choice, especially if you want to increase the performance of your Mac by installing an SSD (solid state drive) to serve as your startup drive. Because SSDs are still expensive when compared to traditional platter-based hard drives, most people buy drives with capacities of 128 GB to 512 GB. Larger SSDs are available, but they cost a good deal more per GB than smaller ones. The problem with smaller SSDs is a lack of sufficient space to house macOS and all your applications, plus all your user data. The easy solution is to move your home folder to a different drive. For example, say you want to swap out your startup drive for a much faster SSD with a 512 MB capacity — enough to hold all your current data and allow for future growth. A quick look at the price of SSDs in that range likely will send your wallet into sticker shock. If you could delete some data, or better yet, just move some of it to another hard drive, you could get by with a smaller, less expensive SSD. If your home folder is using, say, 250 GB on the startup drive, moving your home folder data to another drive could pare that down to about 130 GB for the operating system, applications, and other necessary items that must remain there. And that means a smaller SSD in the range of 200 GB to 256 GB would be large enough to meet current and future needs. That's much easier on the budget. If you're using OS X 10.5 or later, the process is actually pretty simple. Before you begin, make sure you have a current backup, using whatever method is your favorite. For example, you might clone your current startup drive, which still contains your home folder, to an external bootable drive. That way, you can restore everything to how it was before you began this process, if necessary. Using the Finder, navigate to your startup drive's /Users folder. For most people, this is /Macintosh HD/Users. In the Users folder, you'll find your home folder, easily identified by the house icon. Select the Home folder and drag it to its new destination on another drive. Because you're using a different drive for the destination, the operating system will copy the data rather than move it, which means the original data still will remain in its current location. You'll delete the original home folder later after you have verified that everything is working. 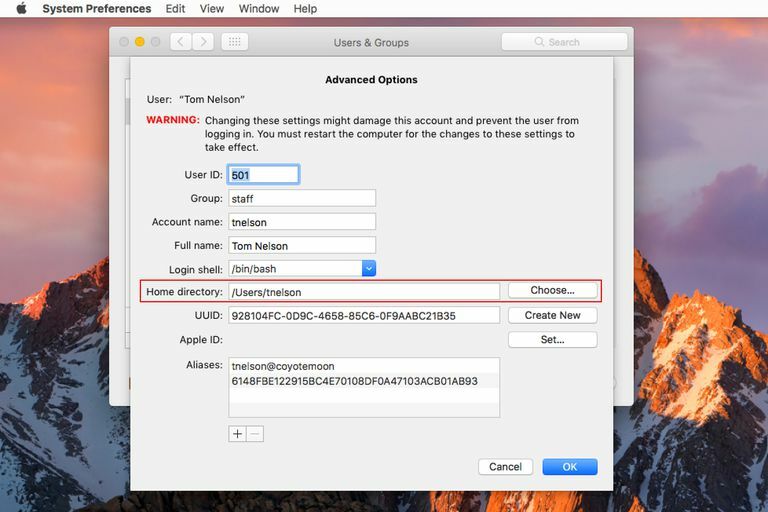 In the Accounts preference pane or the Users & Groups (OS X Lion and later), click the lock icon in the bottom left corner, then provide an administrator name and password. From the list of user accounts, right-click on the account whose home folder you moved, and select Advanced Options from the pop-up menu. Do not make any changes to Advanced Options except for those noted here. Doing so can cause quite a few unforeseen problems that could lead to data loss or the need to reinstall the operating system. In the Advanced Options sheet, click Choose, located to the right of the Home directory field. Navigate to the location you moved your home folder to, select the new home folder, and click OK.
Click OK to dismiss the Advanced Options sheet, and then close System Preferences. Restart your Mac. It should use the home folder in the new location. Navigate to the location of your new Home folder, which should now display the house icon. Launch TextEdit, located at /Applications. Create a test TextEdit file by typing a few words and then saving the document. In the dropdown Save sheet, select your new Home folder as the location to store the test document. Give the test document a name, and click Save. Open a Finder window, and navigate to your Home folder. Open it and examine the folder's content. You should see the test document you just created. Open a Finder window, and navigate to the old location for your home folder. This home folder should still be listed by name, but it should no longer have the house icon. Try out a few applications use and your Mac for a few days. If all is well, you can delete the original home folder. You might wish to repeat the process for any additional users on your Mac. Although there's no specific requirement for the startup drive to have an administrator account, it’s a good idea for general troubleshooting purposes. Imagine that you've moved all your user accounts to another drive, either internal or external, and then something happens to make the drive that is holding your user accounts fail. You can use the Recovery HD partition to access troubleshooting and repair utilities, but it's easier to have a spare administrator account on your startup drive that you simply log into when an emergency occurs.